Violinist Marta Szlubowska describes MSE in this way: Marta Szlubowska Ensemble has been a dream come true for me. I am very thankful to my parents, Danuta and Janusz Szlubowski for helping me realize this dream. I chose my favorite pieces and melodies from around the world, which I know the audiences will enjoy. With MSE I am able to direct the performances, collaborate with wonderful musicians and be the soloist. We perform without a conductor, which puts more demand on all of us. Without the conductor we become better leaders and are more involved in listening and watching each other in order to create a perfect blend of ensemble and expression. We hope you will come to hear us play again and again! We are here to entertain you and make you happy with our music!” The ensemble was founded in the summer of 2012 with the intention of contributing to the cultural life of the already musically rich state of Mississippi. 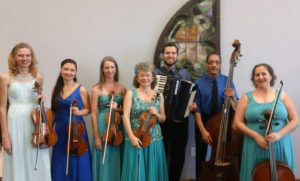 MSE plays the music of Easter Europe as well as provides the audiences with the performances of classical and popular music that the audience will recognize and love. Marta and Janusz (Marta’s father, who plays accordion in MSE), who are the founders of MSE, both come from Poland and wanted to share the music that they knew and performed in Poland. 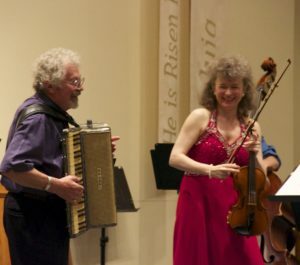 Music they love includes tangos, folk tunes of many nationalities, gypsy music, famous songs from around the world, as well as the beautiful melodies of great classical composers such as Dvorak, Vivaldi, Monti, Kreisler, Wieniawski, Sarasate and many more. Their repertoire also includes American music of such composers as Gershwin, Berlin, Bock, Garner and others. We look forward to seeing you at one of our beautiful and entertaining concerts in Mississippi and beyond! Click these links to look at examples of our LONG and SHORT programs.